Great price Fast ship, Great. Fair price and fast shipping. Decent shape wedge. Exactly as discribed. Quick shipping! Thanks! good buy ! it was a lil more "Used" than I was expecting. This is a nice feeling, weighted wedge, Also has a good visual. I now play on Bermuda grass in Florida. When I lived up North and played on "regular grass" I always pitched with a 60 degree inside 80 yards from rough and fairway. On the Bermuda the club slides under the grass too much so this 56 really helps make more solid contact. 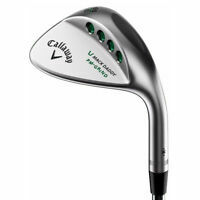 Well I've only played 2 rounds with them so far but, I could tell after just after nine holes that these wedges were more accurate than my old ones. I didn't think that these clubs would make that much difference but they have !! Has a very good feel when swinging the club. The club is exactly what I was looking for and it works perfect. It was a used club that I purchased and the wear was less than expected. The grip could have been removed, it was shot.